Whatever its origin, most scientists agree that homochirality must have begun with a tiny excess of one handedness in the chemistry of the primordial broth. Recently, chemists have discovered a mechanism that might explain how that slight imbalance could have developed into a complete predominance of one handedness, with the virtual absence of the other. Homochirality itself may not be so surprising after all—although knowing which of the two possibilities occurs on any given planet remains a toss-up. There is some reason to believe that nature favors homochirality: It takes extra metabolic energy to keep molecules of different handednesses separate, says Jack Szostak, a biochemist at Harvard University. “There is a selective pressure to have a system that is basically homochiral,” he says. However, the laws of physics provide little reason to think that the original choice of biochemical chirality could have been anything other than random. Chemistry is ruled by electromagnetic forces—which determine how atoms, molecules, and electrons interact—and electromagnetism doesn’t distinguish between left and right. For that reason, a reaction between, say, two left-handed molecules should proceed at exactly the same rate as the same reaction between the right-handed equivalents of those molecules. Then how did our world end up with homochiral biochemistry? Scientists have proposed various mechanisms that might have generated a small initial excess of one handedness over the other (Science News: 5/5/01, p. 276; and 9/6/03, p. 157). For example, right- and left-handed molecules respond differently to circularly polarized light, whose waves move in a corkscrew fashion that can have either a right- or a left-handed twist. If the organic matter that seeded life on Earth formed in space, as some scientists have suggested, astrophysical sources might have zapped it with circularly polarized light, perhaps selectively destroying molecules with a particular handedness. Organic matter found in some meteorites indeed shows a slight excess of left-handed amino acids. In this scenario, if such a meteorite had been hit by corkscrew waves with the opposite twist, life on Earth could have ended up with the opposite chirality. If, by contrast, nature shows a consistent preference for one handedness over the other, that bias must exist somewhere in the laws of physics. Like electromagnetism, neither gravity nor the strong nuclear interaction cares about chirality. The exception is the fourth fundamental force, the weak nuclear force, which can tell left from right. But this asymmetry mostly shows up in certain kinds of nuclear decay, offering little opportunity for any influence on life. Through the quantum property known as spin, however, the weak interaction also exerts a small effect on the way atomic nuclei interact with electrons. As it moves about within an atom, an electron can occasionally—by the rules of quantum physics—fly through the nucleus. When that happens, nuclear particles influence the electron via the weak interaction in a way that depends on the orientation of the electron’s spin relative to its motion. “It’s as if the sun’s gravity had a force that depended on the direction of the Earth’s axis of rotation,” says Norval Fortson, a physicist at the University of Washington in Seattle. In the 1960s, scientists realized that this effect, called parity violation, could induce a tiny energy difference between the corresponding electron states in left-handed and right-handed molecules. That difference could mean, for example, that breaking up a left-handed amino acid might take slightly more energy than breaking up its mirror-image counterpart. If left-handed amino acids were stabler, they could have slowly become more abundant. Whether these effects could have any practical consequences remains questionable. “As far as I know, they’ve never been measured in the lab, even with very delicate experiments under highly controlled circumstances,” says physicist Frank Wilczek of the Massachusetts Institute of Technology. If they exist, energy differences between electron states in left- and right-handed molecules are expected to be many orders of magnitude smaller than the energies involved in chemical reactions. “Any energy difference is going to drown in the noise of any chemical process,” says Donna Blackmond, a chemist at Imperial College London. Even so, chemist Dilip Kondepudi of Wake Forest University in Winston-Salem, N.C., says that a small effect pushing consistently in one direction—such as slightly favoring left-handed amino acids—could win over a noisy background in the long run. Kondepudi and his collaborator George Nelson, now at the National Cancer Institute in Bethesda, Md., theoretically calculated this “noise-averaging” effect in 1985. Over the years, several groups of researchers have claimed to have observed intrinsic chiral preferences in biological molecules. Most scientists have judged these experiments as inconclusive at best, however. Although he calls himself a skeptic, Deamer says that some of these effects seem too interesting to ignore. When Deamer was visiting the Weizmann Institute in Rehovot, Israel, in the late 1990s, Meir Shinitzky, a chemist there, showed him some surprising findings. Shinitzky had noticed that an amino acid called tyrosine had two different crystallization rates in its left- and right-handed forms. Deamer reproduced the same results at his lab, trying to rule out any contamination problems. “No matter how hard we tried, we still saw a difference,” he says. Deamer, Shinitzky, and their collaborators published their results in 2002. If, in some primordial pond, a right-handed amino acid crystallized faster, it would have left behind a solution enriched with the left-handed version. That could have got biochemistry started on the road to homochirality, Deamer explains. Moreover, he and Shinitzky suggested that parity violation could be behind the asymmetry that they discovered. They speculated that parity-violating energy differences would endow left- and right-handed amino acids with slightly different magnetic properties that would make them interact differently with water molecules. As a result, water molecules that form a layer around dissolved amino acids might bind a little more strongly to the left-handed version, so it would crystallize more slowly than the right-handed version. “A lot of the energy that goes into making a crystal comes from breaking this layer,” Deamer says. Critics pointed out that undetectably small impurities in the samples easily could have produced a spurious effect, because crystallization is so sensitive to details of the steps that get it started. But Deamer and Shinitzky say that when they repeated their experiment in heavy water—water made with deuterium, the isotope of hydrogen that has a neutron in its nucleus—the effect virtually disappeared. Molecules of heavy water have weaker magnetic interactions than molecules of ordinary water do. In 2005, Shinitzky and his collaborators made another surprising observation. They took spiral-shaped molecular chains of the amino acid glutamate, which spontaneously unwind as the solution in which they’re dissolved becomes less acidic. The researchers found that left- and right-handed versions of glutamate unwound at different acidities. That difference largely went away, however, when the experiment was repeated in a heavy-water solution. His team published these results in the December 2005 Physical Chemistry Chemical Physics. Robert Hazen of the Carnegie Institution of Washington, D.C. maintains that it’s hard to rule out contamination as the explanation for such findings. “It’s almost impossible to find a chirally neutral environment on Earth because life’s chiral excesses infect everything,” he says. And even if the experimental results are true, says Martin Quack, a physical chemist at the Swiss Federal Institute of Technology (ETH) in Zurich, the researchers have demonstrated no credible link with the weak nuclear force. More recently, a team at DESY, a particle accelerator lab in Hamburg, Germany, studied synthetic left-handed versions of RNA in addition to the natural right-handed forms. By shining ultraviolet radiation on RNA suspended in water, the team measured the energy that it takes to excite some of the electrons in the molecules. The scientists found that handedness mattered. “There is a difference on the order of one part in one thousand” between the two forms, which is likely to make the left-handed form less stable, says team member Michael Rübhausen, a physicist at the University of Hamburg. That difference was many orders of magnitude larger than the expected effects of parity violation. Hamburg chemist Christian Betzel, a coauthor of the study, says that he can’t explain the phenomenon, but adds that “it would be interesting to see if it happens in heavy water.” The results are due to appear in the journal RNA. However homochirality arises, a tiny seed of chiral asymmetry in the first molecules of life represents only a fraction of what it would take to bring about fully homochiral biochemistry, in which molecules of one handedness dominate the scene, while the other handedness has all but disappeared. Recent studies suggest how that result could come about. Kenso Soai of the Tokyo University of Science and his collaborators first demonstrated experimentally in the mid-1990s that some molecules can catalyze the synthesis of copies of themselves. That process can amplify any small initial imbalance in chirality and lead to the complete dominance of one handedness over the other. Just how this molecule was able to multiply at the expense of its oppositely handed counterpart remained unclear until 2001, when Imperial College’s Blackmond and her collaborators discovered a possible mechanism underlying Soai’s reaction. The idea is to have a molecule that tends to bind to itself in pairs and that catalyzes production of new copies of itself only when in pairs of the same handedness. Suppose an initial mixture contains slightly unequal numbers of the two types—say, 102 of type A and 100 of type B. If all pairings are equally probable, the mixture will typically form into 50 AB pairs, 26 AA pairs, and 25 BB pairs. Only AA pairs and BB pairs can reproduce, so to speak, yielding more A and B molecules, respectively. Because the AA:BB ratio is 26:25—which is larger than 102:100—the proportion of A molecules in the mix will be slightly greater after reproduction and will further increase at each generation. “Once the reaction takes off, it will never look back,” Blackmond says. A mechanism such as this could explain how homochiral biochemistry, favored for reasons of metabolic efficiency, might actually come about. But whether life has the same handedness throughout the universe, or leans randomly to the left or right every time that life springs up, is a question that can be resolved only through a deeper understanding of the laws of nature. Or by eating a lot of alien pizza. 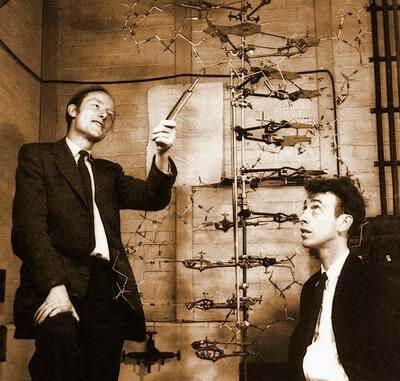 This was the original 1953 photo of Francis Crick (pointing) and James Watson, as they contemplated a model of the 3D structure of DNA they figured out. All life forms on earth have DNA, which in normal conditions winds up in a right-handed double helix (called this way in analogy with a right-handed screw). The DNA’s backbone is made of sugary molecules. Earth life forms use right-handed sugars; in principle, life forms could exist that use left handed sugars. 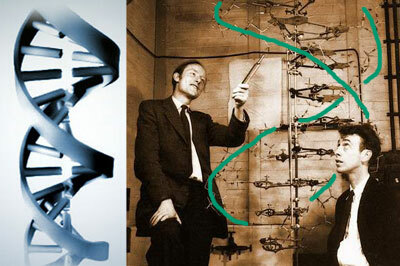 DNA based on these molecules would wind around as a left-handed screw. 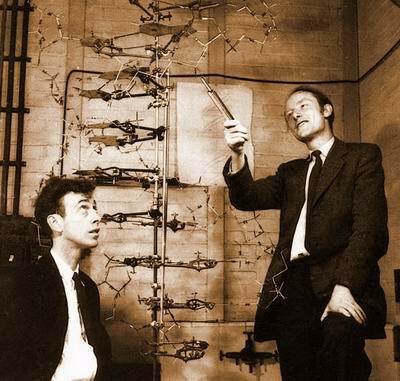 If alien versions of Crick and Watson exist somewhere in the universe, they may have been wondering why the DNA they discovered was all left handed.